Enjoy a good book, play, entertain friends and family or enjoy a big cook out in your own backyard! After you’ve had Koch Kuts create your perfect backyard escape, you won’t want to leave your house to enjoy a vacation. 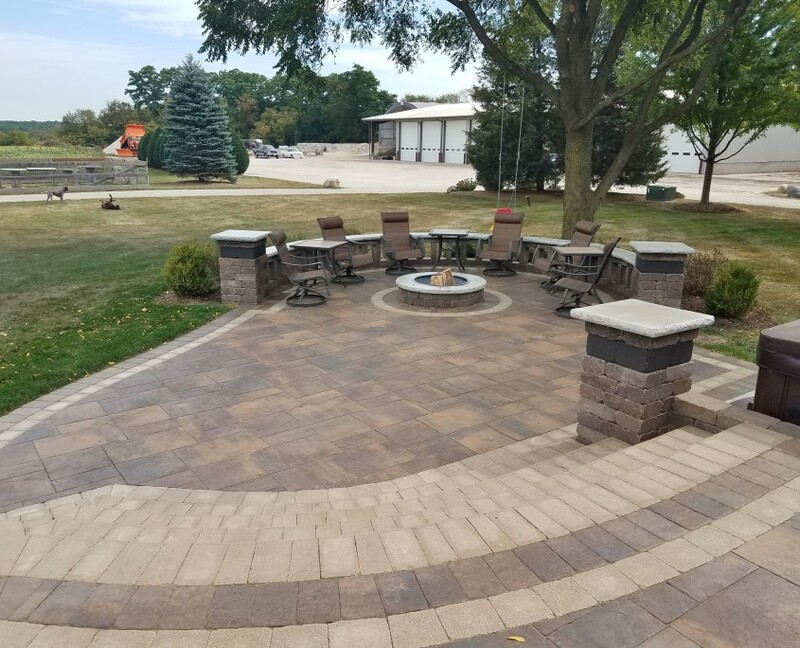 Imagine turning your backyard into such a relaxing hot spot that a “staycation” actually sounds like fun.Koch Kuts Landscaping and Maintenance is proud to be your source for the finest patios and other exterior services in Burlington, Waterford, Mukwonago, WI and the surrounding areas. Whether you’re looking to transform your backyard into a popular hangout spot for family and friends, or bringing to life a tranquil reflection space, the professionals at Koch Kuts is the best choice for patio design and installation. Our Burlington hardscape contractors will walk you through all of your options and make sure you get the exact patio you want. Contact us today to get your project started! You’ll soon be relaxing in a comfortable, versatile outdoor area equipped with every feature you envisioned – with endless possibilities including adding a fire pit, grill-island, standing pillars, garden planters, retaining wall, or walkway. If you’re ready to build the outdoor living area of your dreams, put time into choosing the right contractors for the job. 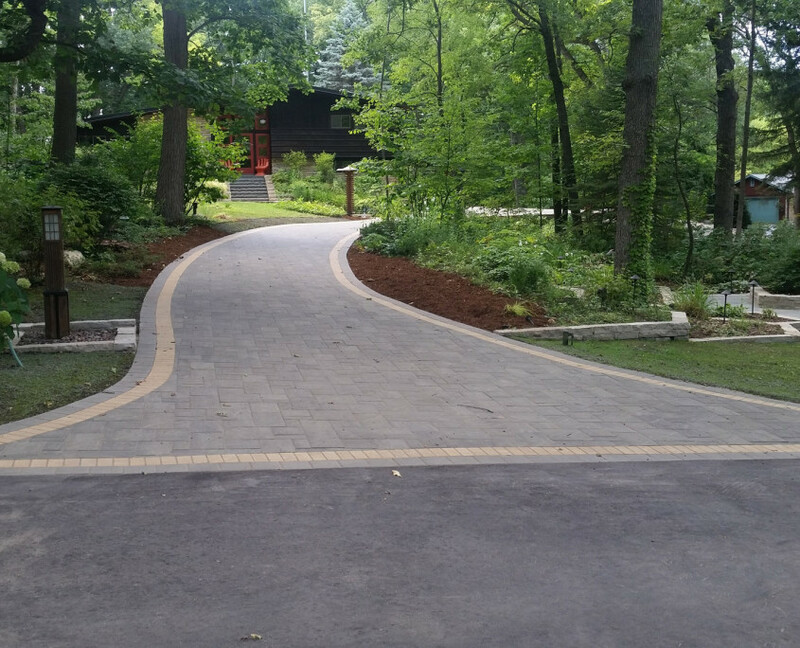 Look for a company with a long history of client satisfaction; read customer reviews, ask for photos of their past hardscape projects, and set up a consultation to assure you can work happily alongside the landscape designers you choose. The only limit to your patio and outdoor space is your imagination – and of course, landscape restrictions. Concrete, brick, and natural stone patios all have their advantages as well as special maintenance needs; our friendly, knowledgeable professionals will walk you through all of your options, from materials to design details and hardscape add-ons. We’re dedicated to providing quality services from initial contact through completion of your patio installation. Whether you have a backyard that is prone to weeds, standing water and pests, or a wonderful yard that just needs some sprucing up. Koch Kuts offers an array of options for expanding your living and entertaining space. It will be our pleasure to meet and exceed your expectations for style and practicality. Why Choose Koch Kuts for Brick Patio Installation? As brick layers, the experts at Koch Kuts can install high quality and attractive patios. Beyond that, brick surfaces are ideal when it comes to walking safely. With this durable, slip and fade resistant surface, you’ll find that your outdoor space is suddenly far more versatile. Better yet, bricks have a natural, warm color and are more receptive to ground shifts than slabs of concrete. Of course, there’s no need to stop with simply a patio or driveway surface. Why not add a pathway, a fire pit, outdoor fireplace or even an outdoor kitchen? You’ll never want to go back inside when you can cook, eat and relax in the gentle spring and summer air. 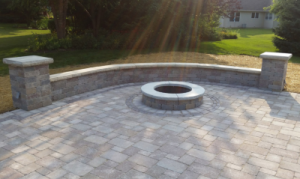 Contact our patio installers for incredible hardscape services in Burlington, WI and surrounding areas. Koch Kuts has been providing area homes and businesses with patios and other brick laying services since 1996, and is family owned and operated. Let our family help yours make the most of your backyard this year.